1. The flame used by welders in cutting metals is __. A. Y is twice as soluble as X. 3. Tetraoxosulphate(vi)acid is prepared using the chemical reaction SO3(g) + H2O(s) → H2SO4(l). Given the heats of formation for SO3(g), H2O(l) and H2SO4(l) as -395KJmol-1, -286KJmol-1 and –811KJmol-1 respectively, the enthalpy change accompanying this reaction is __. 4. In two separate experiments 0.36g and 0.71g of chlorine combined with a metal X to give Y and Z, an analysis showed that Y and Z contain 0.20g and 0.40g of X respectively. The data above represents the law of __. 5. If an element x of atomic number z and mass number y is irradiated by an intense concentration of neutrons, the relevant nuclear equation is __. 6. The vapour density of a gas may be defined as __. 7. 30cm3 of oxygen at 10 atmosphere pressure is placed in a 20dm3 container. Calculate the new pressure if temperature is kept constant. 8. A liquid begins to boil when __. 9. Four elements W, X, Y and Z have atomic numbers 2, 6, 16 and 20 respectively. Which of these elements is a metal? 10. When cathode rays are deflected unto the electrode of an electrometer, the instrument becomes __. 11.When large hydrocarbon molecules are heated at high temperature in the presence of a catalyst to give smaller molecules, the process is known as __. 12.If concentrated sulphuric acid is added to sugar and warmed gently, the sugar changes from white to brown and finally to a black mass of carbon. In this reaction, concentrated sulphuric acid is acting as __. D. Liquid particles dispersed in liquid. 15. P(g) + Q(g) 3R(s) + S(g) ∆H is negative. Which of the following will increase the yield of R? A. using a larger closed vessel? 16.The mass of silver deposited when a current of 10A passed through a solution of silver salt for 4830s is __. 17.CO(g) + H2O(g) →CO2(g) + H2(g) from the reaction above, calculate the standard heat change if the standard enthalpies of formation of CO2(g), H2O(g) and CO2(g) in KJmol-1 are -394, -242 and -110 respectively. 18.If the electron configuration of an element is 1S22S22p5, how many unpaired electrons are there? 19.Which of the following gases can best be used for demonstrating the fountain experiment? 20.The coloured nature of transition metal ions are associated with their partially filled __. 21.Which of the following separation processes is most likely to yield high quality ethanol (≥ 95%) from palm wine? 23. In the reaction: 3CuO + 2NH3 → 3Cu +3H2O + N2 how many electrons are transferred for each mole of copper produced? 24. The electronic configuration of an element is 1s22s22p63S23p63. How many unpaired electrons are there in the element? 25. 8.0 g of an element X reacted with an excess of copper (II) tetraoxosulphate (VI) solution to deposit 21.3g of copper. The correct equation for the reaction is __. 26. In the manufacture of iron in the blast furnace, iron (III) oxide is mixed with coke and limestone, and different reactions occur in the process. Which of the following, statements are true with respect to these reactions? The electrons of two atoms Y and Z are arranged in shells as shown above. The bond formed between the atoms of Y and Z is __. 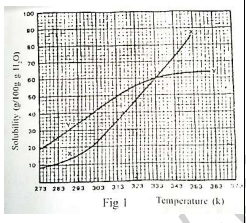 28.A gas sample with an initial volume of 3.25 dm3 is heated and allowed to expand to 9.75 dm3 at constant pressure. What is the ratio of the final absolute temperature to the initial absolute temperature? 29.The chemical used for coagulation in water purification is __. 30.A liquid that will dissolve fat is __. 32.The number of atoms in one mole of a substance is equal to __. D. the number of electrons. 33.Which of the following terms indicates the number of bonds that can be formed by an atom? 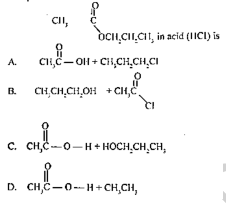 34.The structural formula of ethanoic acid is __. 35.Environmental pollution is worsened by the release from automobile exhausts of __. 36. What volume of 0.5 mol dm-3 H2SO4 will exactly neutralize 20cm3 of 0.1 mol dm-1 NaOH solution? 37.Which of the following is an electrolyte? Which of the following would introduce the greatest increase in the rate of the chemical reaction above? B. A decrease in volume and an increase in the pressure of the reactants. 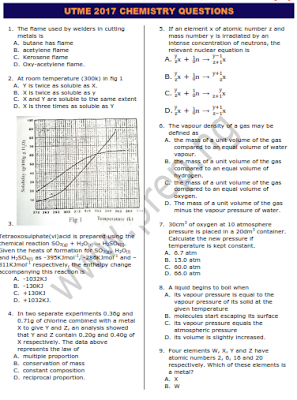 39.Which of the following substances has the lowest vapour density? 40.The presence of an impurity in a substance will cause the melting point to __.